The Tamoil SA refinery in Collombey has been producing a wide range of finished products since the 1960s, including various types of fuels and heating oils as well as liquefied petroleum gas (LPG), the latter of which is used as an alternative fuel for vehicles and as a raw material for the petrochemical industry. LPG, which consists of C3 and C4 hydrocarbons, constitutes only about three percent of the refinery's production. Nevertheless, it is highly significant because it is sold for use in LPG-powered vehicles, and - most importantly during wintertime - is used as a blending ingredient in liquid fuels. In total, more than 250 m3 of LPG are produced each day in Collombey. It is separated in three distillation columns (Fig. 1), i.e. during naphtha stabilization, reforming stabilization, and after hydro-treatment of light gas oil. The heavy fraction of the latter separation is fed back into the atmospheric distillation. By reducing the amount that must be recirculated, this extensive separation of LPG has the direct benefit of reducing energy costs.Furthermore, the higher purity of the LPG fractions produces economic benefits arising from the better fit to specifications. The composition of the LPG fraction is thus critical to the refinery's efficiency. The demand for a more efficient operating mode for the columns requires more precise information about LPG composition, which conventionally has been conducted by means of manual sampling laboratory analysis. Most important is the information about the C5+ content, i.e. the concentration in the LPG fraction of components having a higher boiling point, which is required at a higher frequency than is possible with conventional techniques. From the start it was most important to select an LPG analysis solution that was state-of-the-art and robust, yet attractive in terms of total cost of ownership. After discussions with Yokogawa the decision was made to go with a gas chromatograph (GC) solution. A key requirement was the ability to conduct an analysis in near real time. For a GC solution, this is achieved most economically by positioning the analyzers close to the columns (Fig. 2). 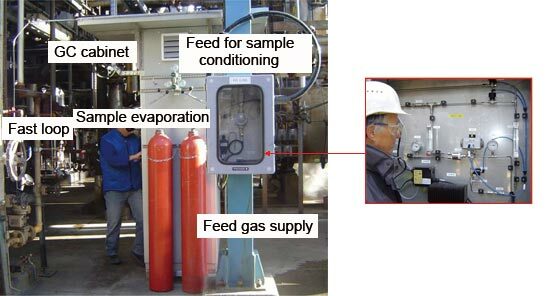 A minimal fast loop sampling concept, developed together with Yokogawa, presented further advantages: near real-time access to precise process information, coupled with simple and therefore robust installation. Yokogawa's analyzer, the GC1000 Mark II, also has the advantage of not requiring air conditioning in decentralized applications. To determine the C5+ contents in the shortest possible time, this analyzer utilizes the backflush technique. GC units were installed on all three LPG columns. The exact positioning and arrangement of the sample supply were done in consultation with Yokogawa and its authorized local installation partner. The equipment was installed as part of a planned plant shutdown in the summer of 2007. Afterwards, the measuring points were gradually put into operation in August/September 2007. Although the analyzers are several hundred meters apart on the plant premises, they can be controlled and supervised from a central server. In addition to online status information, detailed status reports and chromatograms can be called up, and calibration procedures can be initiated and monitored. Only the replacement of empty carrier gas bottles and calibration medium still has to be done at the analyzer cabinets. The key objective was to achieve a clear increase in efficiency, and this has already been realized. Around the clock, a measured value for the C5+ concentration is now available every 150 seconds, at each measuring point. The ability to obtain these precise and reliable values has led to substantially improved distillation quality. The quick and timely adjustment of distillation parameters is now possible, bringing the total response time down to as little as 15 minutes. The new analysis equipment has proven to be particularly successful in the columns downstream of the hydrotreaters. The increased separation efficiency yielded approximately 1.5-2 m3/h more LPG than before. The resulting increase in the amount of LPG available for sale and the energy savings from the reduced feedback to the atmospheric distillation column contributed significantly to the bottom line. Ciro Pendino, Process Control Engineer and Group Leader at Tamoil SA, said: "The analytical upgrade project with Yokogawa's process GCs was a complete success. All systems have worked very reliably from the start. Clear responsibilities and short response times led to the fact that barely a year separated the first tender and commissioning. The choice of an experienced system supplier, who was responsible for the entire project from solution design through planning, engineering, installation and start-up up to the training of the workers, has proven to be optimum for us. This was all the more applicable because the project required a high level of process understanding and was therefore in good hands with a competent project manager. In this way, additional workload for the refinery personnel could be avoided. Tamoil has received a convincing solution, last but not least due to an efficient and competent system partner, with whom we co-operated on this occasion for the first time, but certainly not for the last." The ability to perform discrete separation and positive identification of components and measurement of the composition without interference is an advantage of the gas chromatograph. The process gas chromatograph is widely used in many industries. The GC8000 has a built-in 12-inch color touchscreen display that dramatically simplifies operations. At the touch of the screen, the technician can access all of the analytical parameters and measurement results; displayed in easy-to-understand graphical color screens.